Last year, Prof. John Dodson, the Head of Institute for Environmental Research (IER), Australian Nuclear Science and Technology Organization (ANSTO), visited Institute of Earth Environment (IEE), Chinese Academy of Sciences (CAS) and proposed bilateral collaborating plans on climate changes. According to the schedule of the plans, researchers from ANSTO and researchers from IEECAS co-organized a joint field expedition and sampling in Australia during August 25th - September 8th, 2014. 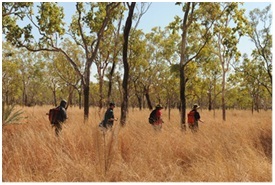 On August 27th, the IEECAS-ANSTO joint group including Yanjun Cai, Zhenchuan Niu, John Dodson, Matthew Fischer, Tom Cresswell and Monika Markowska reached the Katherine town, Northern Territory, Australia and set up a plan for the field expedition. 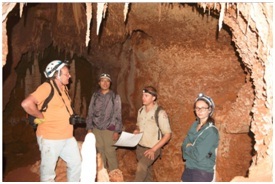 With the guide and help of the head ranger, Andrew Causebrook, the joint group successfully avoided poisonous snakes, and made a successful expedition within the Nitmiluk National Park (Figure 1) and the dark, moist and narrow Oolight Cave, Hot Hole Cave, Echidna Cave, Cutta Cutta Cave and Kintore Cave to get a batch of precious speleothem samples (Figure 2 and 3). 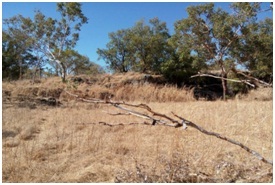 Additionally, the joint group obtained some atmospheric CO2 samples (Figure 4) at some background sites in Northern Territory and at some urban sites in Darwin and Sydney. After fulfilling the expected goals, the IEECAS delegation returned to China on September 8th. 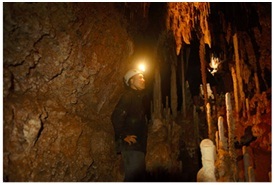 This expedition and sampling is another substantial collaborating activity between IEECAS and ANSTO on climate changes in recent years, which will further promote the friendship and collaboration between the two institutes on the studies of speleothems and 14C tracing.